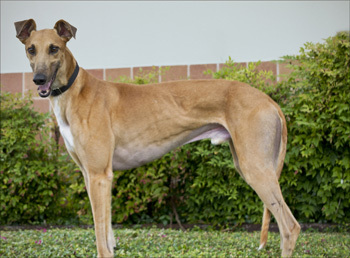 Prancer is a 4-year-old red male born on November 4, 2007. His sire is Get Over and his dam is Miss Jessica. 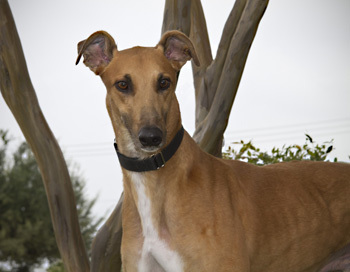 Prancer has 42 races to his credit on Greyhound-data.com, starting August 30, 2009 in Dubuque, IA and ending with a broken hock on June 3, 2011 at Gulf Greyhound Park in LaMarque, TX. Prancer was evaluated at VCA Preston Park Animal Hospital and his surgery was performed by Dr. Bob Radasch at the Dallas Veterinary Surgical Center on Tuesday, June 7th to repair the fracture. Surgical screws were implanted to stabilize the hock which may have to be removed at a later date if irritation occurs. Dr. Radasch feels the repair was successful. Prancer is not cat tolerant. Prancer is one fun-loving boy! He's the best of both worlds--he's ready to go at the jingle of the leash, but he also lounges with the best of them. Prancer is all about his people! We affectionately call him The Sidler (a "Seinfeld" reference) because we'll look down and he's right there. We think he's afraid he'll miss out on some good TLC or something. He does love to play with our resident playmate, too, though. He has a goofy way of enticing her, which consists of various head movements along with a little rooing. Prancer does not like to be crated, though. He has tried in the past to pull at the crate door with his teeth, which obviously isn't good for him. We babygate him in our bedroom, and he does just fine. He's got no interest in pottying in the house either. 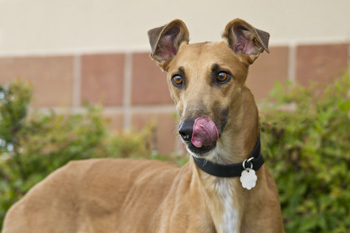 If what you're looking for is a handsome, sweet, chill, slightly goofy (in a good way) boy, give Prancer a try!